Zales is one of the best known names in jewelry. They specialize in diamonds. But they also carry a large line of fine jewelry and watches. Gifts for any occasion can be found at Zales Fine Jewelry. Their wide selection also allows budgets of every size to be able to find beautiful jewelry at the right price. 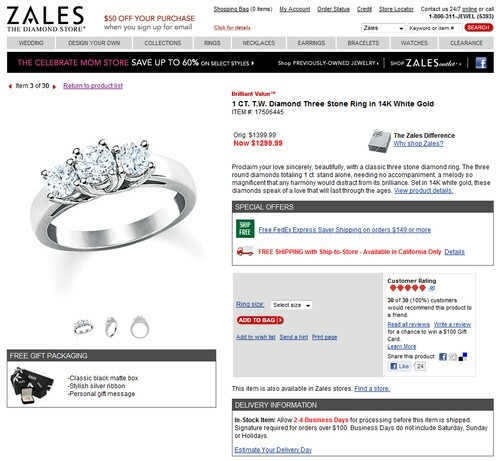 Zales also has a 100 day guarantee. If the gift selected isn’t quite right, it can be returned for a full refund. Some purchases also include replacement of a lost diamond should that ever happen. 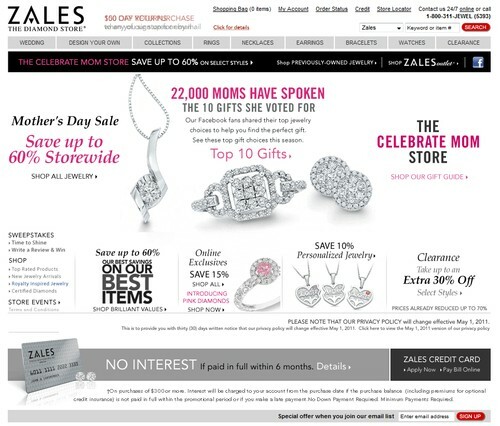 Zales has many locations nationwide. This makes buying quality diamonds easy. Quality is a major component of Zales sales. They have several ways customers can get very high quality for a good price. The size of their selection alone gives them purchasing power that they, in turn, give to their customers. They want customers to be completely happy with their purchases, which is why they have the 100 day risk-free return policy. They also have a trade in program in case customers wish to upgrade their diamond rings. The old ring can be put toward the purchase price of the new one. The value of the old ring is its original purchase price. Buying a diamond has never been so easy. Zales Fine Jewelry understands that a diamond is an investment and they make it easy to pay for it in a manageable way. They have several credit options available to customers as well as a layaway program. The layaway program requires 10% down then the rest of the cost is split up into 10 payments. They have many locations around the US for ease of shopping. They also have a website that makes for easy access. Exclusively at their online store they have custom ring building available. The website also has a pre-owned jewelry page and an outlet page for even more affordable options. Though Zales specializes in diamonds they also offer other unique items like pearls, gemstones, class rings, watches, etc. They have unique and beautiful designer jewelry for men, women, and children. They sell loose diamonds as well as set ones. Their collections include colored diamonds, special cut diamonds, Christian jewelry, and birthstone jewelry. Zales Fine Jewelry has been in business since 1924 and continues to bring high quality fine jewelry to both the online customer base and all its locations across the US. Your blog is interesting, beautiful and full of information. I will learn from you if I want to make my blog popular, I think.